CMA Songwriters Series - Competition Time! It's competition time!.....Deep South USA have 5 pairs of tickets to give away for the CMA Songwriters Series this Friday 6th March at indigo, The O2 in London. 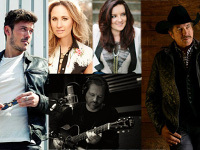 C2C is proud to present the Country Music Association (CMA) Songwriters Series, in London on Friday 6th March 2015 at indigo, The O2, with host Kix Brooks and featuring Brandy Clark, Sam Palladio (Gunnar from TV’s ‘Nashville’), Jessi Alexander and Jon Randall. You are invited to a hosted evening from 6.30-7.30 at The Slug and Lettuce in The O2 (opposite indigo), followed by the show 7.30-9.30pm. You are responsible for your own travel arrangements to and from the venue. Congratulations Mandy Baggot, Chris Stocks, Peter Buyse, Darryn Youngson & Annabelle Wellington.....you have all received a pair of tickets to the CMA Songwriters Series at indigo, at O2, this Friday. If you can email me (tennessee@deep -south-usa.com) your email address I will send you all the details. We hope you enjoy the show!